I wanted to get BG something special for when I come home with the new baby. I wanted a special gift to be able to give her and I like to imagine the time the 3 of us girls will spend together in those first few precious moments when I come home. I also realize I will have a house full of relatives so I don’t know how smoothly that will go or how much like my “ideal”. I am normally the queen of no expectations, just jump right in so I might need to be careful not to “imagine” it too often! The husbeast wants to get her a slide, which I know she would adore but while we search for one second-hand and really if we do get that I am sure I will be stuck outside for hours in the fall so it might be best to save that for a week or two after the baby comes. I am all about the slide, trust me. BG loves slides but I wanted something more intimate and special for me to give to her. 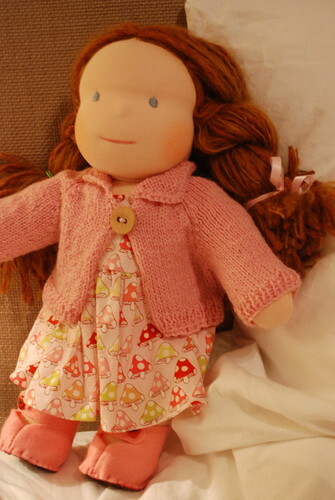 I was on a random crafty momma blog when I saw an ad for the Bamboletta dolls in the side bar (Soulmama I think) and I recognized it so I clicked over and there was actually several dolls available (They sell quickly, Christina posts them on Fridays). I saw one precious one that could not be resisted. An adorable mushroom print dress, and the sweetest little hand knit cardigan (knit by her grandmother!) and of course blue eyes and then I never mind red hair, you all know I’ve always secretly wanted red hair. 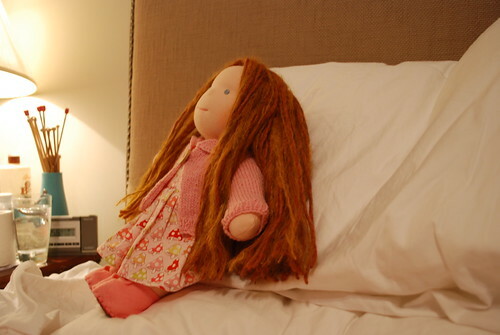 The dolls are stuffed with pure wool and the hair is made from the neatest blend of various yarns (mohair, wool etc). It’s incredibly soft too, softer then I was expecting. I adore her, I sat here for 15 minutes fixing her hair different ways and the husbeast was totally teasing me about it (I needed to get good photos, that’s my excuse anyway). I took off the adorable little handknit cardigan. I thought it was top down raglan but I could tell from the inside that it was seamed, the stitches and seam are perfect, and the little collar is even tacked down. 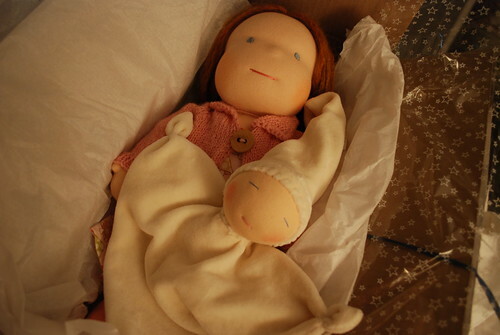 What I love about these dolls is how soft and cuddly and natural they are. I have been making an effort to have as many wooden and fabric toys as possible, vs all the plastic stuff that prevails today. Handmade felt food from etsy, fabric tea pots and wooden kitchen accessories. These things will last, and if they don’t then they will bio-degrade far easier then anything plastic. It makes me *feel good* to see BG surrounded by natural materials. When I ordered the doll I included a little note saying that it was for my daughter as a present for being a new big sister and wrote a little bit about that. I did not use my pixiepurls e-mail or account so it had nothing to do with my blog. I about went crazy when I opened the box. I ordered the doll on the 21st and it came all the way from Canada on Saturday! Inside the box was an extra present (or two). A chocolate bar for my pregnant self, and also included was one of the newborn dolls. I had seen them on the site and wanted one, but couldn’t afford to spend the money on it, yet here it was all nestled in the box! The packaging was superb, it reminds me a bit of Wollmeise, someone who really took time when putting everything together. It’s a business run with love and with care. I wanted to write this blog entry to let anyone out there who has a special someone in their life that might be deserving of such a treat, that these dolls are exquisite, I hope this doll will be around for a very long time, maybe even to be handed down to a granddaughter. Her name is Amelia and I am so looking forward to seeing BG’s reaction when I can give her this special gift. Oh, she is adorable!! i want one for myself! 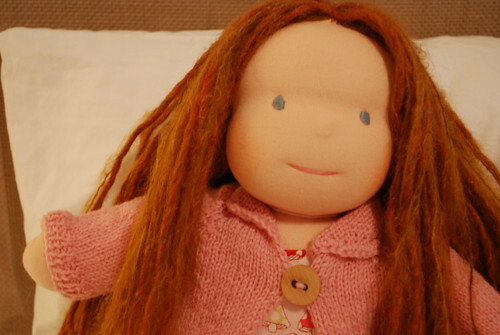 i really do wish I could get my little girl another fabulous handmade doll, but it’s not really in the budget right now. I”m sure BG will LOVE Amelia! how wonderful! what a great doll and i love her clothes. such a special gift for BG. I might have to get one for S for her 2nd birthday. and the newborn doll!!!! how perfect. i love businesses that take extra care of their customers.